The Houston Hip Hop scene has exploded the past year thanks to artists such as Chamillionaire, Slim Thug, Paul Wall, and Mike Jones. However, Chamillionaire just may be the most talented emcee of them all. While he has made his name through the mixtape circuit, he is anything but a one-dimensional emcee. Chamillionaire is out to prove this with his debut album The Sound Of Revenge, which will be out this summer. MVRemix got the chance to chop it up with Cham about his new album, as well as his history in this game. MVRemix: Take us back to when Chamillionaire was a kid or teenager, what were you like? Chamillionaire: I was a multitalented kid. People used to say that I was good at everything that I did. I was very good at drawing and painting and used to play basketball and rap also. I would try to be the best at everything that I was doing and really practice my craft and try to get better. MVRemix: Was is tough growing up in Houston over the years? Chamillionaire: Naw. I had to deal with the same struggles that any other low-income family child growing up. Domestic violence and my mom working 2 jobs to maintain were some of the type of things that I was dealing with. There used to be a lot of tension between the north 7 south side of Houston for a while but that was a faze that kind of disappeared. MVRemix: When did you know you wanted to do this Hip Hop thing for a living? Chamillionaire: I was in love with rap music and music in general early but I didn't realize I was gonna be able to do it for a living until I started making a lot of money doing it. Everybody dreams of having a career or a job that they love and I love rap, but at first I wasn't making enough money doing it. I tightened up my business and then soon started realizing that if I stayed on point I would be able to make a good living doing rap. MVRemix: Why the name Chamillionaire? Chamillionaire: The name comes from me being able to give the listener a variety of different styles. People that are familiar with my work know that I can rap fast or slow and sing the hook all on the same song. The name is stems from the variety of styles that you hear when you listen to Chamillionaire who is an artist rich in style. Most artists are just followers and just follow the lead of whatever hot artist is out and I am a different and original breed of rapper that sounds different and acts different than the rest and them. The chameleon lizard stands out from the rest of them and that's the exact same thing with me verses the rest of the rappers. MVRemix: What did you learn from your dealings with Swisahouse early on? Chamillionaire: I watched and used the experience as a learning process. I saw other people making the money while I didn't so I knew how to get it when I separated myself from them. If you stand next to someone and watch them make all the money eventually after a while you are gonna start finding ways to get it yourself. I learned how to stand on my own two feet and not depend on anyone but myself. MVRemix: Tell us about the Color Changin' Click. Chamillionaire: That's the mixtape group name that we originally started as but it's a chamillitary thing now. Chamillionaire: We doin our thing in the streets of the South right now. Rasaq & 50/50 twin are my artists and OG Ron C is the official DJ for the label. OG Ron C was a former Co Ceo of the Swishahouse but he's doing his thing wit me now. I have some new people that we are thinking of bringing on the team but time will tell. The Future for everybody depends on the success of my project. MVRemix: You are regarded as being a very business savvy man, so what is the key to being successful in this industry? Chamillionaire: Yeah, I have reached a certain level of success from a business point of view but even I realize that I have a long way to go. I look at people like Jay Z, Russel Simmons, Master P, P Diddy, J Prince, and people who have managed to have a high level of success from a CEO's position and that's where I'm trying to get. I would have to get to that level of success before I start giving someone else how to get it. I say the more you learn about the business the better your chances of being successful in it. MVRemix: What is the biggest headache you have had to deal with in this Hip Hop game? Chamillionaire: People are gonna always tell you what you can't do, shouldn't do, and what isn't gonna be possible. I am the type of person that will listen and still go try to do it anyways and end up proving people wrong later. Its not to throw it back in their face but its because you never know what's possible if you don't try and a lot of people are scared to try. MVRemix: Your new album, The Sound Of Revenge is set to drop this summer. What can fans expect out of it? Chamillionaire: The public can just expect a creative, lyrical, original, and well put together album. I want the listener to feel like they just inhaled a breath of fresh air. A lot of the music coming out today has the same sound and no replay value and my aim is to give them, something that they will appreciate all the way through. MVRemix: Who is doing the production on the album? Any guest appearances? Chamillionaire: Scott Storch, Cool & Dre, David Banner, Play & Skills, The Beat Bullies, Kenoe, Mannie Fresh, DJ Toomp, KLC, Dj Paul & Juicy J and a long list of other producers. I have worked with a lot of people and I'm not final on which songs will make the album but I have a lot of good production. MVRemix: What types of topics, issues and concepts will you have on the album? Chamillionaire: I come from a world of mixtapes where people are used to me rapping about anything that comes to mind on mixtape beats. This album shows a lot of different sides of Chamillionaire and the South in general. For me creativity is the key to success because there is so much music that comes out that doesn't have the creative aspect of it. MVRemix: Being from New Jersey, I noticed that New York City and the surrounding area is just starting to become familiar with yourself and the new Houston movement. Are you concerned with breaking into the New York market in the future, is that a goal of yours? Chamillionaire: Yes definitely because most of the artists that are really successful are the artists that can get all the coasts to support them and each artist that cant get over that platinum hump are the artist that are only selling a lot in their region or two regions. I feel like I have a sound that any coast will be able to appreciate because it's Southern but it's creative and lyrical enough for New York to appreciate. DJ's like Whoo Kid & DJ Kay Slay are really showing me love and helping me to break into that market because nobody is gonna known that I am the truth if I don't give them a chance to hear it and see it. MVRemix: Do you think there is a general bias against southern rappers in regards to lyrical skills, as some will say southern emcees don't have the talent to keep up with emcees from the east or west. Chamillionaire: Yea I see that stereotype a lot and I feel like that's why there are so many fans that hope for my success because they feel like I am a rapper that can prove that theory wrong. The way the South is represented is mainly because the major systems that sign a lot of these rappers are only showing the world one side of the Southern rap art form and are not evenly showing the more lyrical side. I think there are a lot of people out here that are very lyrical that just have not made it to the spotlight yet. There is a time for everything so that day will come and hopefully I can be the spark that ignites that flame. MVRemix: What else do you have going on in the future that we did not discuss already? Chamillionaire: I have a lot of mixtapes about to hit the streets because street promotions is a very important way to increase a fan base. I have a mixtape called Big Business with Shady/Aftermath artist Stat Quo and another mixtape dropping with DJ Whookid. I have a highly anticipated Mixtape Messiah 2 CD that will be hitting the streets soon also. 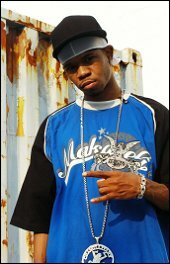 Chamillionaire: Check me out on www.chamillionaire.com if you want to find out anything else about me and keep your eyes on me. I will definitely be making a lot of noise this year. "People are gonna always tell you what you can't do, shouldn't do, and what isn't gonna be possible. I am the type of person that will listen and still go try to do it anyways and end up proving people wrong later."